In case you’ve been living under a rock (astrologically speaking, of course), let me bring you up to speed: Mercury retrograde starts just a few hours after Venus retrograde comes to an end on Nov. 16. No, you aren’t dreaming. Yes, this is really happening. You’re probably wondering how anyone could be having a good week at this point, but believe me. 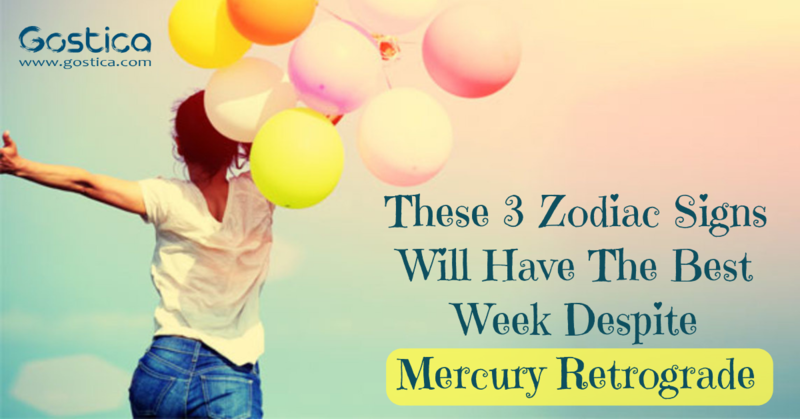 The cosmos always find a way to show us positivity in the face of hardship, and beginning November 12, 2018, this will be the best week for these zodiac signs: Libra, Scorpio, and Sagittarius. You better believe you’ll feel the good vibes just as strongly if any of these happen to be your rising sign. I know the word “retrograde” sends so many of us running for cover, but let’s be optimistic here. There’s still so much to be grateful for. After all, Venus retrograde is finally over! I mean, how emotionally challenging was that experience? Chances are, your heart went through plenty of dark times, but now you’re coming away from the experience with a newfound understanding of love. And, dude, let’s not forget that Jupiter (the planet that literally rules over luck and prosperity) just entered its home sign of Sagittarius. Blessings will soon be on the way, so try not to let the difficulties of “right now,” cloud your hope for a brighter future. OK, you seriously need to start jumping for joy right now because Venus, your ruling planet, is officially out of retrograde. Although you aren’t completely in the clear of her confusing effects because this retrograde will still be in it’s post-shadow period until Dec. 17, you can definitely start celebrating. The hard part is now over. This retrograde spiraled through your first house of the self and your second house of finances, teaching you important lessons that will reinforce the ground you walk on. Not only are you embracing a deeper connection with the person you are, your reevaluating what it is that you truly need in order to feel safe. You are growing, baby. Don’t you dare stop now. The cosmos are officially done screwing with your birthday season because this week, Venus will finally begin moving direct. Not only are you free from its emotionally complicating effects, the sun will still be in your first house of the self until Nov. 22. Right now, the energy is exactly to your liking, and the person dominating the world is none other than you. This period is intense, spiritual, sexual, passionate, and even chaotic. We’re all braving the choppy waters of these effects, but the person swimming through its darkest depths is you. I bet you can’t get enough of it. Show us the way, your majesty. I know I’ve said it multiple times, but you’re really about to have a lucky year. After all, Jupiter — the luckiest, happiest, and most expansive planet of all — is your ruler, and did you know that Jupiter just entered Sagittarius last week? Whenever Jupiter changes signs, it marks the beginning of a new chapter of growth that effects us all. We take on new opportunities, absorb wisdom from new places, and see a whole different picture than we did before. However, Jupiter is working at its highest power when it’s rolling through your zodiac sign. Even though we’re all bound to reap the benefits, it’s you who will be most empowered by the shift in energy. Lasting until Dec. 2, 2019, you better believe it’ll be one of your best years yet.